No-one can really feel the pain of another when a loved one dies. Or the the moment that another experiences and feels in the minutes and seconds before that person dies. But does it have to be such a bad thing? Exit approaches the question in many ways, and with our motto, taking away the fear of death. We believe there are both physical and emotional challenges to be surmounted, as well as that area that some call spiritual, some call philosophical, or some would simply say, “getting my head round it”. Physical questions that can be covered include how best to approach one’s illness realistically in terms of treatments, making what is left of life worthwhile for as long as that is possible. Knowing what symptoms can be treated successfully, and which ones mostly can not. Knowing how to get the best out of terminal care. And the aspect we are most associated with (though not our only concern), how to draw things to a close a bit sooner rather than a bit later. Even that knowledge can be empowering. We don’t make grandiose claims about a magic pill, or that it will be easier or harder than it sounds: we just research and publish the science. The emotional aspects are just as important, how we cope, how our loved ones will cope, how we should tell people. (We deal with these too!) But the question most people will discuss is, “How do I live when it sinks in that I am going to die?” – a question that becomes ever more pertinent as we enter later years, as serious illness looms, and as friends or family members die before us. It is something we can only put off for so long. Facing the inevitable prospect is probably better than avoidance, but is it possible not simply to make it a negative but to make it an inspirational positive? In coming months we hope to share with our Exit Euthanasia Blog readers some excerpts from our print magazine on this very subject (please note that we do not publish precise instructions on self-euthanasia on the Blog, but provide updates within the awareness that the Blog goes to a general audience of all ages). The Southbank Centre is correct in that Western society distances us from mortality, it distances us from death. A little while ago, I interviewed a member who had embraced the lifestyle of Nepal. One of the main features she spoke of was how death was so much a fact of life. Biers were carried in the street, cremations performed on an open pyre. Death was never far away, but not in a bad sense. Ancient Egyptian Pharaohs commenced work on their tombs the minute they had ascended to the royal throne: the idea that the “heart was weighed” after death was a guiding principle in life, each action to be performed with Maat, an idea of justice and balance, so that one might set an example in all things. A much publicized tale from Bhutan recently by travel writer Eric Weiner explained the habit of the Bhutanese in thinking about death “for five minutes every day” as a cure for panic, psychosomatic problems, or simply lack of contentment with life. Socrates and the Platonists of Ancient Greece found that much fear of death was rooted in personal relationships that would not be continued. To counter this, one can dissociate from relationships and then re-enter them as part of the joys of life, yet with an attitude of balance, loving appropriateness (or the Egyptian maat). The Southbank Event may well have a strong emphasis on Christianity, which is one of the common threads for most people in the U.K., but there will be “talks, panels and debates covering topics such as whether we have the right to die, burial rites, apocalyptic religions and the way to immortality.” Panelists include the Bishop of Leeds and the London Philharmonic Orchestra is showcasing Berg’s Violin Concerto, dedicated to ‘the memory of an angel’, which “conveys a bottomless depth of personal loss.” They also perform Penderecki’s St Luke Passion, a work which “struggles and laments towards redemption.” There is, however, a “Right To Die” debate on assisted dying (1:00 pm, 4th March), a ‘Death Cafe’ (same day) and other talks, discussions and events that increase awareness of mortality. Does it sound like the upbeat, constructive approach for instance of many TED lectures on the subject? Perhaps not at first glance: but given the Southbank’s formidable reputation for great events it will quite possibly be a huge success! Let us know your thoughts. click “join” on the left hand side. 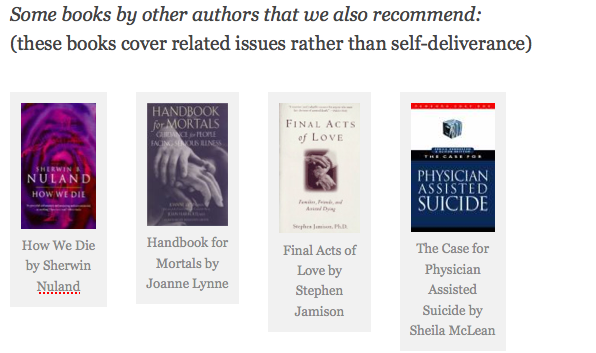 To get free updates on this Blog by email, or to find our publications, use the right hand column and click on subscribe or the links to our books, or the top menu on publications for more information. Exit works in the self-deliverance movement independently but as part of a non-competitive environment. We review similar work by other people and organisations to demonstrate both diversity and congruence. Our work is supported by extensive (published) scientific analysis but our only funding comes from donations and memberships. (You can also donate using the button in the right hand column). I am looking for help and can find nothing. My husband chose to end his own life after a long period of suffering with a progressive neurological condition. I understand his reasons and admire his courage. I am now alone with young children. Is there any kind of support for those bereaved by – I don’t know what to call it – ‘rational suicide? self-deliverance? The normal grief support groups don’t fit, and neither do the specialist ‘bereaved by suicide’ ones, since in this case there is no loss of potential and I don’t wish I’d been able to prevent it. Is there any way to make contact with others in this situation? Exit’s focus is always on the individual who wants to die, not on those who survive them. You make an important point Sarah. With the resources that we have, our primary focus is indeed on research and publication of arts and science of self-deliverance: yet we are not oblivious to the dilemmas of bereavement, as you probably picked up on in our article on the Southbank event, or the more recent article looking at the philosophy of Plato.